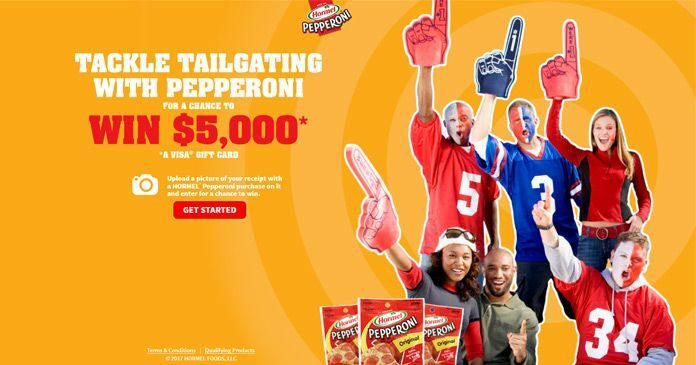 This football season, tackle tailgating with HORMEL pepperoni and enter this Sweepstakes at Hormel.com/Tailgate for a chance to win a $5,000 VISA gift card or one of 50 $150 cash prizes. Over $12,000 in prizes are available to be won. The HORMEL Pepperoni Tailgating Sweepstakes is open only to legal residents of the 50 United States and the District of Columbia, who are 18 years or older at the time of entry (or 19 for residents of AL and NE). Void where prohibited by law. The Sweepstakes begins on September 18, 2017 at 12:00:00 AM CT and ends on October 29, 2017 at 11:59:59 PM CT.
During the Sweepstakes Period, purchase any package of HORMEL Pepperoni, then take a photo of a receipt showing your purchase. Next, visit Hormel.com/Tailgate to fill out the online official entry form and upload your Receipt.You will automatically receive one entry into the Sweepstakes. Limited to a maximum of one entry per person per day. There will be a total of one Grand Prize winner and fifty First Prize winners who will be randomly selected from all eligible Entries received during the Sweepstakes Period. The random drawing will occur on or about October 30, 2017 and potential winners will be contacted on the day of the random drawing via his/her email or telephone as provided on the Entry Form. First Prizes (50): A $150.00 Visa Gift Card. Total ARV of all prizes is $12,500.00. For the Sweepstakes Winners’ names (available after November 30, 2017), send a hand-printed, self-addressed, stamped envelope by November 5, 2017 to: Winners List, HORMEL Pepperoni Tailgating Sweepstakes Winners, PO Box 93142, Atlanta, GA 30377. Residents of Vermont omit postage. Hormel Foods Sales, LLC, 1 Hormel Place, Austin, MN 55912.